Hello again – welcome back to some more sharing of the Christmas cards that we created at my Holly Jolly Stamp-a-Stack last weekend. There’s just 2 more cards to share; everyone made 2 cards each of 5 different designs. This is such a ‘traditional’ card in style, that I decided to mix things up a bit, and create it using non-traditional colours! Starting with a 4″x5 1/4″ panel of Sweet Sugarplum cardstock, we stamped the poinsettia outline in Sweet Sugarplum ink, creating a tone-on-tone look. 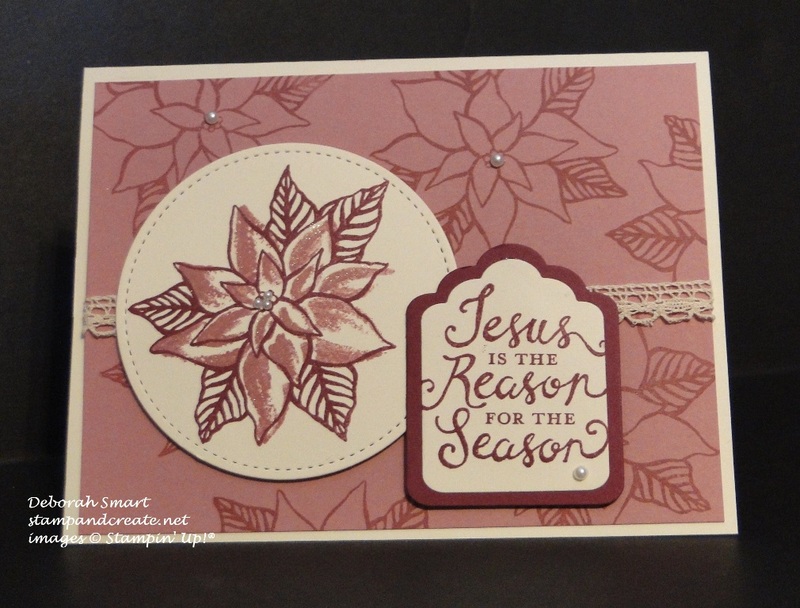 Then on a piece of Very Vanilla cardstock, the same poinsettia outline was stamped in Rich Razzleberry ink; the watercolour effect flower colour was stamped in Sweet Sugarplum ink. The Very Vanilla piece was then die cut using the Big Shot and the Stitched Shapes – Circles shape. The sentiment was stamped in Rich Razzleberry ink onto Very Vanilla; it and the layer below it were die cut using the Big Shot and the Tags & Labels Framelits Dies. The cardstock layer below the sentiment is Rich Razzleberry. Before the stamped pieces were attached, I wrapped a length of the Very Vanilla 1/2″ Lace Trim around the middle of the stamped Sweet Sugarplum panel, attaching it to the back using Tear & Tape. Then, the stamped image pieces were attached using Stampin’ Dimensionals. To finish off the card, I added 3 very small Pearls to the inside of the focal poinsettia, and larger pearls among the background and sentiment stamps. Everyone just loved this card – even though the only stamping is the sentiments, inside & out! We started with a panel of Crumb Cake cardstock. I cut 2 banner shapes from Early Espresso cardstock, then 2 banner shapes from 2 different patterns of the Candy Cane Lane DSP. The banner tails were made using the Banner Triple Punch, and the length of each banner was staggered, and the DSP attached using Multipurpose Liquid Glue. I then die cut 2 different sizes of circles, using the Big Shot and the Stitched Shapes – Circles dies, from Real Red and Early Espresso cardstock. After layering them together with the glue, I attached the little gingerbread house that I had hand cut from the Candy Cane Lane DSP, using Dimensionals. After attaching everything to the Crumb Cake cardstock panel, I stamped the sentiment from the Wondrous Wreath stamp set, in Early Espresso ink, to the bottom right corner. 3 Rhinestones were added, above the chimney, to mimic smoke coming from the chimney. The panel was then attached to an Early Espresso cardstock card base. There’s still time for you to get your holiday favourites, before they’re gone for good; the YearEnd Closeout Sale is still happening, and there is lots of stock still left – only a few things have sold out. Just CLICK HERE to go directly to my online store. Or, if you’re hoping to put something under the tree this weekend – I sell Gift Certificates! You choose the amount; I’ll fill out the information, email you an invoice, and you’ll have the Certificate the same day, via email! Thanks for visiting me today – I hope you have a very Merry Christmas, and I’ll see you again soon! I love all of your Christmas cards but I think the one with the reindeer on top of the medallion is definitely my favorite. It is just gorgeous. I hope you have a very Merry Christmas, Deborah! Maybe we can meet again in November at SLC!